The nearly 30,000 square feet of electronic advertising to be emblazoned on the building facade of the proposed Wilshire Grand project is likely to bring millions in revenue to the property owner, but nothing to the barren treasury of the city that is being asked to allow the signage by granting exceptions to the city’s ban on new off-site advertising. This fact has been thoroughly drowned out by a chorus of cheerleading for the project, led by City Councilwoman Jan Perry and echoed by her many of her council colleagues. A final vote to establish a special sign district allowing the electronic signage on the billion-dollar hotel and office project at Wilshire Blvd. and Figueroa St. is scheduled for March 29. In fact, the issue of signage revenue coming to the developers, Hanjin International and Thomas Properties Group, was only obliquely referred to in a six hour City Planning Commission meeting on the project last December, and in two recent meetings of the City Council’s Planning and Land Use Management (PLUM) committee. The possibility of the city sharing in some of that revenue was never mentioned. Because the developers haven’t revealed the amount of revenue they expect from selling advertising on the signage embedded in the building façade, it can only be roughly estimated. However, extrapolating from known amounts sign companies have charged for similar signage elsewhere shows that the revenue could easily run into the millions every year. According to a court filing in another lawsuit between a sign company and an advertiser, two supergraphic signs on a building adjacent to the 405 freeway cost the equivalent of $16 a square foot monthly. At that rate, the Wilshire Grand signage would bring in more than $5 million a year. 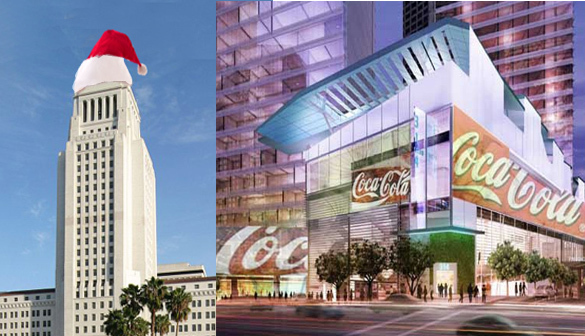 Because the electronic signage proposed for the Wilshire Grand is capable of changing messages, unlike the static supergraphic signs, a more accurate comparison might be with digital billboards. According to a 2009 article in the Los Angeles Business Journal, a full-sized digital billboard in the city generates between $68,000 and $96,000 a month for the sign company. Using the lower figure, that’s approximately $100 per square foot of signage space. If the revenue from the Wilshire Grand signage approached that figure, it would mean $28 million a year for the property owner. Although construction union members have been vocal supp0rters of the project, the city has laid off employees in an effort to close a budget gap that could approach $400 million next year. Some city services have also been eliminated or curtailed because of a revenue shortfall.